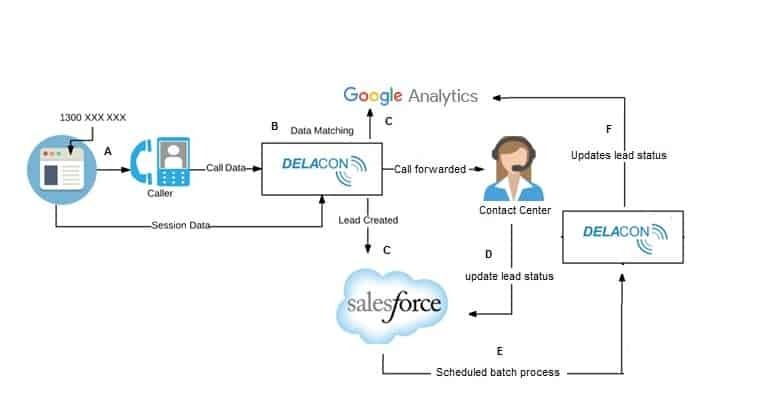 Delacon’s integrations with Salesforce and Google Analytics allows call data to be pushed into Salesforce (as a newly created lead) and Google Analytics (as events). We have taken this further by providing an integration between Salesforce and Google Analytics, allowing certain Salesforce call outcome statuses to be pushed into Google Analytics. The purpose of the integration is to provide valuable insights in Google Analytics by utilising the CRM data held in Salesforce and use this data in AdWords to make better marketing decisions. With this data, you can identify the complete journey of the call – from the traffic source/keyword that generated the call, to the account created in Salesforce, to the final outcome (whether a sale was won or lost) – in Google Analytics. By integrating this into GA, advertising and marketing teams can make better marketing decisions in areas such as bid management and bid optimisation. What outcome statuses can be pushed into Google Analytics? Marketing Qualified Leads: A prospect which has expressed an interest in your product or service and based on your qualification criteria, has been converted from a lead into an account and passed onto your sales team. Sales Qualified Leads: A lead which has been further qualified by your sales team with a specific opportunity identified and created. Sale Closed Leads: A lead which has completed the sales process and closed – either as a closed/won opportunity or closed/lost. When a caller dials a Delacon call tracking number – whether that’s from a website landing page, AdWords campaign or eDM, Delacon’s system matches this number with the web session, while connecting the call to the termination number. This is a standard Delacon process. A lead is then created in Salesforce and an event is sent into Google Analytics. Qualifying the lead further and creating an account in Salesforce, indicating the lead is interested in your product or service (a marketing qualified lead). Upon further qualification, an opportunity is created in Salesforce, indicating the lead is definitely interested in your product or service (a sales qualified lead). Closing the opportunity when it is no longer being pursued – either because the opportunity has been won or they have become a customer or if the opportunity has been lost (a sales closed). In order for the integration to work, the CRM data needs to be sent into Delacon. This is done in report format and you will be required to setup 3 daily Salesforce reports for each of the outcome statuses above. Our setup guide has information on how to create these reports. These reports will need to be sent into Delacon and will automatically upload into your Google Analytics, matching it with the original phone call event. Our setup guide has information on how to create these reports and how to automate the sending process. What does the data look like in Google Analytics? In Google Analytics, a custom dashboard can be set up displaying the relevant information, allowing you to see how many phone calls, marketing qualified leads, sales qualified leads and closed sales your business has received in a given period. You can also see the total value of the closed sales as well as the keywords which generated each event. What is the benefit of the integration? The major benefit of the integration is being able to track your calls all the way through the sales process. By matching this data to the original lead source, you can gain a better and more accurate picture of your cost per acquisition. The sales revenue from those calls (assuming this is accurate in Salesforce). One of the great things about the integration is that it works for any web leads submitted via online forms. This allows for all lead data that is being captured by your CRM to be pushed into Google Analytics, providing more accurate information. To get a more accurate CPA number, you simply take your total marketing cost and divide by the total amount of closed sales. Want to know more about how this integration works? Don’t hesitate to contact us today!